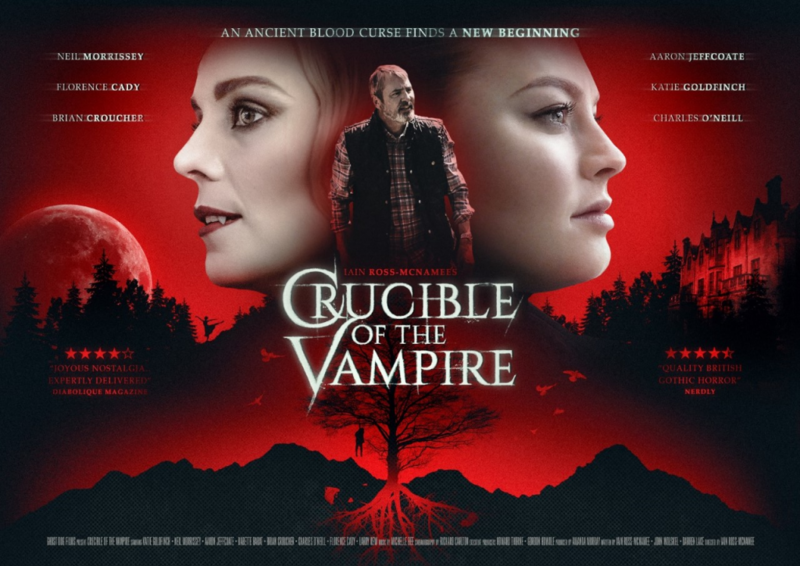 ‘Crucible of the Vampire’ is a new release UK film and, if classic horror stories are your thing, it’s easy to recommend. The film opens with a period themed introduction as we are thrown back into Britain’s dark-age history, a time of corruption, paranoia and swift judgement for anyone society deemed an outcast. In this case we see the accusation, trial and execution of a man thought to be dabbling in necromancy following several reported sightings of his recently deceased daughter. With him out of the way the only remnants of his activities is an old cauldron (the crucible) which is then cleaved in half by the inquisitors sword. Cut to modern times, and we are introduced to Isabelle, a museum curator who is asked to inspect and verify the missing pieces of the aforementioned crucible which has been recently unearthed in the basement of an eerie old manor house. The plot follows Isabelle to the old house, and her torment following her arrival. In a predictable, but entertaining story, the family living there are not quite as clueless about their discovery as they try to make out – not surprising to us the viewer however, their personas with foreign accents, poor temper and pale complexions are as much of a give-away that I would have been more surprised if they were not connected to vampirism in some way. Yet despite its complete lack of mystery the film remains intriguing non the less, a credit to the cast and attention to detail. The characters, the locations and some saucy set pieces really help to craft a story which is heavy on atmosphere, nostalgically akin to older films with similar themes. The casting is spot on. Katie Goldfinch stars as Isabelle, a believable girl next door type whilst Babette Barat and Florence Cady play gothic femme fatale types opposite her. As these occupy the bulk of the screen-time it was great to see not only some great chemistry, but a commitment to giving their somewhat cliched characters the edge they needed to come to life. Mr Neil Morrisey plays a lesser role as ‘Robert’; the family’s gardener, but still, his experience brings some much needed umph to the support cast, giving a depth and context to the films plot outside of the eerie mansion house. Talking of which. What a banger of a location, stunning. To the crew’s credit, the lighting and cinematography make use of the stately homes natural ambience to make some of the scenes in this film move from genuinely creepy to quite scary! It also adds some allure and gothic romanticism to some of the films more sensual scenes, without them becoming tacky. The whole vibe just works. If there were to be any criticism it would be with the story’s depth. As I’ve already mentioned, it is really very predictable, and the ‘twist’ (or at least the uncovering of the films threat) ending comes across a little farcical considering you’ve known its coming the whole time. Other than that, there’s not a lot not to say other than perhaps some of the support cast acting isn’t quite up to par with the rest of the main cast, and of course N. Morrisey. Overall, whilst perhaps no single element of the film is particularly stand out, ‘Crucible of the Vampire’ is one of those films which is just a great watch. If you like classic horror tales or want something to watch with those less acquainted with cult horror, then this film is definitely a shout.